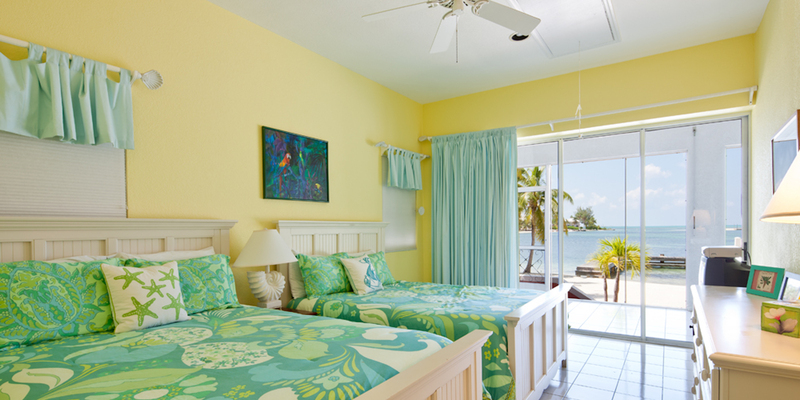 Master king and double-queen suite both open onto the screened porch. 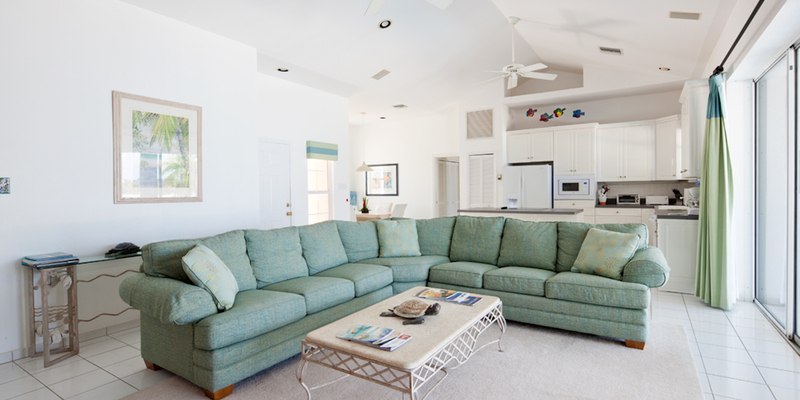 Living area features a large sectional sofa, flat screen TV, and sliding doors to the adjacent screened porch. 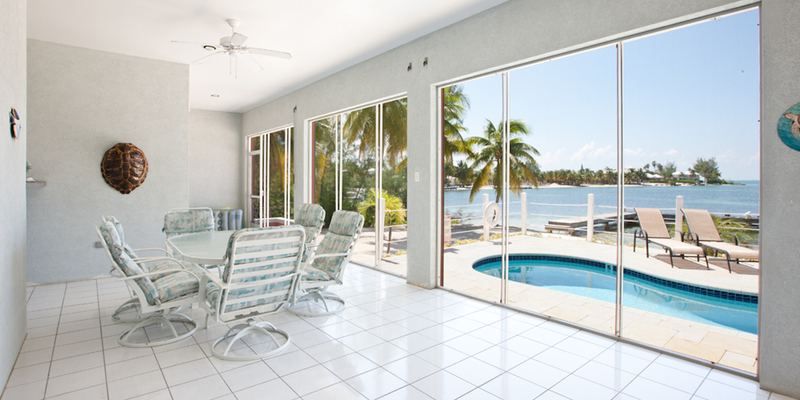 Screened porch includes outdoor dining for six and lounge chairs for napping, reading, or soaking up the views. 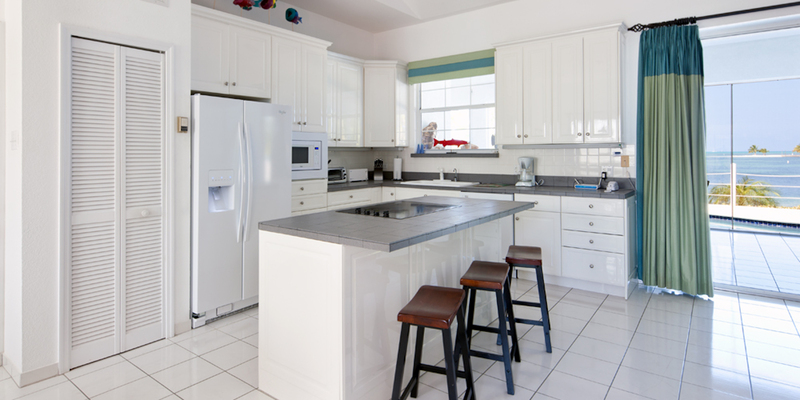 Modern kitchen with standard appliances; dishware, cookware, cutlery, blender and a coffeemaker all provided. The cove and North Sound are excellent for kayaking, and the private dock allows guests to scan the shallows for turtles and eagle rays. Rented water sports equipment can be tied to the home's private dock. Owner provides 2 paddle boards and 2 kayaks (signed waiver required). 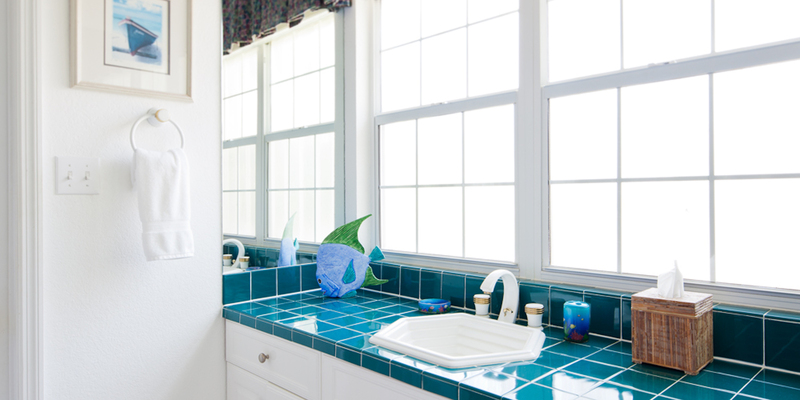 Fantasea accommodates up to 6 adults max. Excellent for small families, groups and couples. 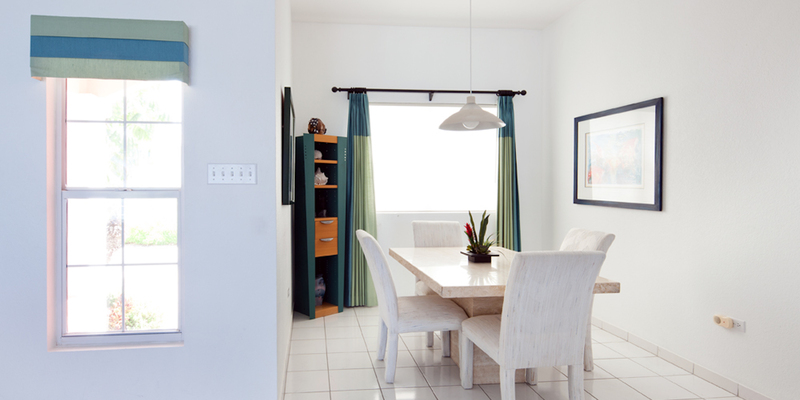 In addition, Fantasea makes a great overflow villa for larger families when rented with other villas in the Cayman Kai area. 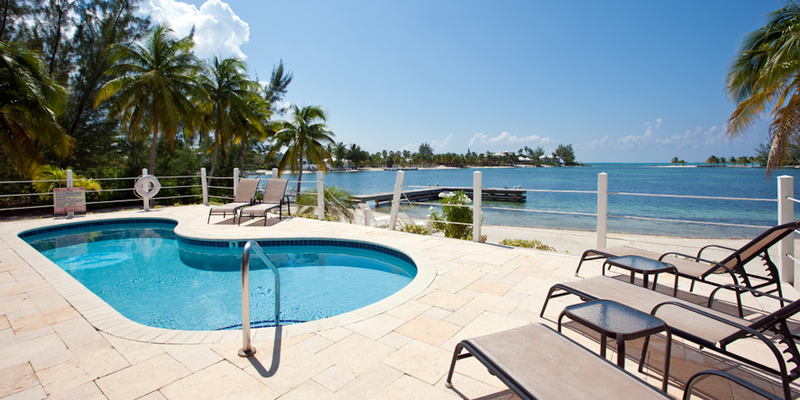 The cove-front homes in Cayman Kai offer calm serene water for docking a rental boat, permitting charter captain pick-up or just safe shallow water for little children. Adults won’t swim in the cove—Rum Point is too nice by comparison—the water is shallow and has a softer bottom and there is no reef here for fish life...but we do see the occasional turtle, eagle ray or tarpon swim by in the shallows! Fantasea had everything to make our stay enjoyable. The home was very clean. The kitchen was well equipped. The kayaks and paddle boards were wonderful to use in the secluded bay. 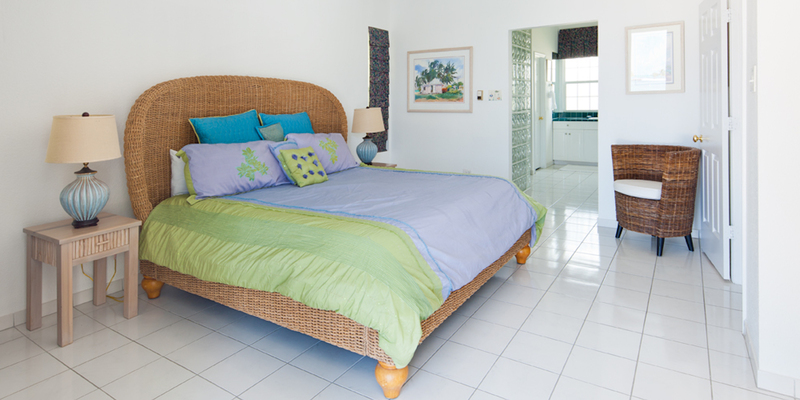 The home is walking distance to Rum Point and also to Kaibo. It’s the perfect spot on the island for a relaxing family holiday. Our family of 5 absolutely loved our stay at Fantasea. The property was exactly as depicted in the photos/description -- we used the kayaks/paddle boards every day, and we enjoyed spectacular sunset views from the pool deck. The GC Villas staff were great to work with, very friendly and efficient. We especially enjoyed the free snorkel gear, bluetooth speakers, and beverage cooler. You also get a discount card to be used at local vendors. Overall, we loved it here and definitely would come back! Wonder private getaway! The house has everything you need! The house is the perfect island getaway. It’s on the East end of the island away from the crowded cruise ship area. We spent lots of time on the deck & screen porch watching the water. You can actually see the boats gather at Sting ray city from the porch. There are several great restaurants at that end too. But the house has everything you need to cook at home too. It took us a while to get a recommendation but a local finally told us we could purchase fresh fish & lobster tails from Over the edge restaurant. We ate at that restaurant a couple of times too. Excellent food & service. Starfish point right around the corner. We took the 3 person kayak out for a spin around the cove. There are quite a few jellyfish that are photo synthesizing in the water that you have to be careful of if you decide to snorkel there. But Rum point offers another good alternative to snorkel that’s very close to the house. The rental agency recommended downloading the app to use when you get there. It’s got great info and directions to the house. I highly recommend taking screen shots of the directions to the house, as the app did not work for us unless we were on Wi-Fi. Luckily we remember enough and followed the signs and maps we got from the rental car place to get us there. Their office was still under construction so we didn’t get to utilize that upon arrival. We would highly recommend this house and will be back again. Fantasea is just that for us. It is our fantasy away from reality. This is our third time coming here - we have been coming to Grand Cayman for 12 years and stayed at numerous small homes. None are as charming with the view and location Fantasea offers!The home has plenty of room, actually larger than it appears in pictures. The pool is just the right size for the home. The decor inside is comfortable and the kitchen is well stocked. We paddle board and kayak every day and the bioluminescent bay is beautiful every time! Short walks to Rum Point or Kaibo for dinners. All you need and more!!! Great home for our family! We stayed 10 nights at Fantasea in March for an extended spring break with our family. We could not have been happier with the home or the location. The Cayman Kai area is safe enough for our kids to walk to rum point or starfish point without worry. They also kayak every day right off the back beach. The swimming is fine, but better up the street at rum point. There is very little traffic as the area is residential. We were pleasantly supprid=sed at how much there was to do right in the area. We did adventure out to see the island and enjoyed several restaurants including Tukka, Bombay Chopsticks and Over the Edge. We also took the Red Sail catamaran from rum point to Stingray Sandbar to swim with stingrays. What I thought might be a bit scary ended up our most wonderful experience of the week - simply a must when you come! We were happy with the home, the furnishings and the kitchen. But we ate most meals out in the area to get the local fare. Hope this helps. We loved our stay at Fantasea and plan to return! This is our second time to Grand Cayman and first time at Fantasea. We were ecstatic with our accommodations. The manager was friendly and offered suggestions for restaurants and things to do. The last home we stayed in was in this same area with another rental company - and we will never go back. This home was in great condition, where the other was run down. This home appeared loved by the owners, the other was neglected. I\'m not mentioning names, not my style. 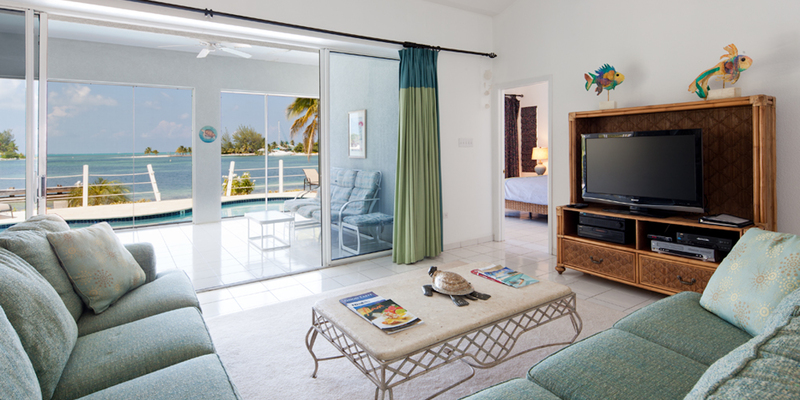 But safe to say we will rent again from Grand Cayman Villas and will return to Fantasea. The Rum Point area is fantastic with something to do for everyone. Never a dull moment. Dining for lunch and dinners at Rum Point and Kaibo is very good. We also drove around the east end of the island where we found locals offering meals from their homes in makeshift outdoor seating areas. Recommend Big Tree BBQ. Out of this world. Tukka restaurant had the best Sunday brunch I have ever encountered. We didn\'t eat the rest of the day! Thank you Grand Cayman. See you next year! We are always looking for nicely kept small homes with nice beaches and excellent view. We found it this time in Fantasea. Great views all day and sunsets are special! The home is very nice for a family of 4 and next time our kids plan to each bring a friend. The kitchen is fine. The kitchen has a nice cooktop and microwave which was all we needed to keep everyone fed. We ate out most dinners anyway. The kitchen is clean, crisp and open. The living area and furniture are comfortable. Double queen beds in one bedroom gave the kids plenty of space. The master bedroom was plenty big. We spent every afternoon on the screened porch and the nice pool deck area. It was nice having a dock for the kids to jump in and out of the water. They preferred to walk up to rum point for swimming as its larger, deeper and more things to do there with water sports and snorkeling. Just a short and safe walk away. 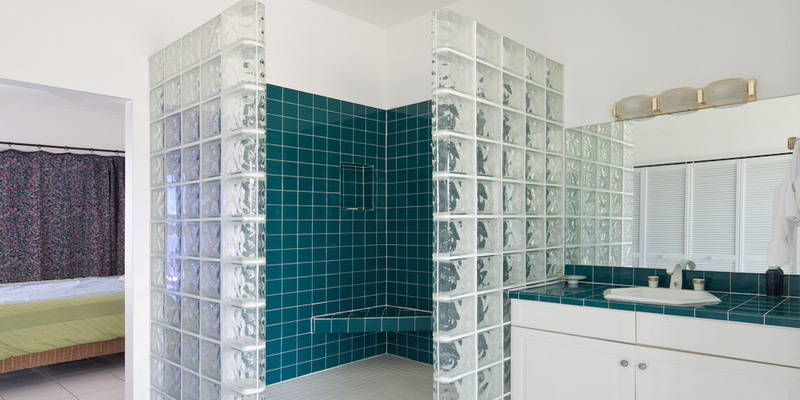 Thank you for sharing your wonderful home with us! What a spot to celebrate my 39th (did I say 40!!!) birthday and our 10th anniversary with our two small children! The area was safe and quiet - no boat traffic or loud jet skis. The kids could play in the water while we stayed around the pool/porch area. 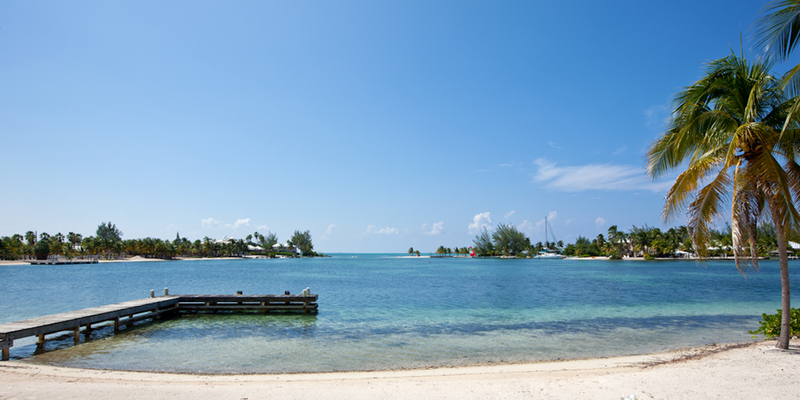 Most days we strolled to rum point for the beach, lunch, nice calm water and other families. So much room inside for our family of 4. Well kept and nicely decorated. 5 Star in our mind!!!! This was a great time of year to come. No large crowds anywhere and so relaxing. We had very nice weather for 6 of the 7 days and the 7th was actually a needed relief as it was very hot - temps in the mid 80s even. Fantasea was great for two couples. We each had our space and the living area was a nice gathering spot. 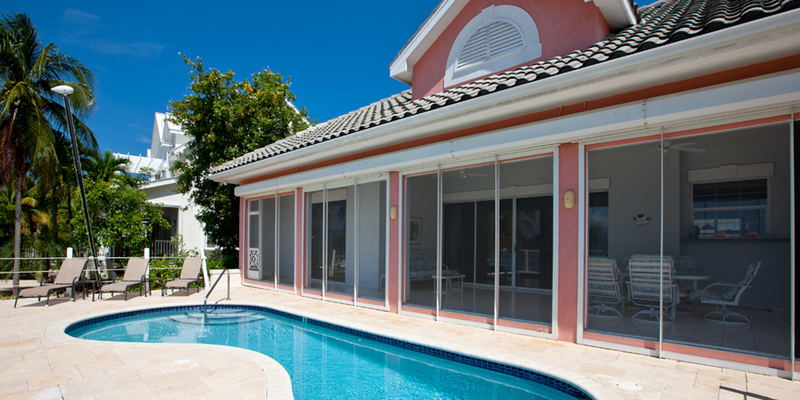 BUT the screened porch and pool deck was where we ended up spending most of our time. We walked to the Kaibo for dinners on 3 occasions, and I have to say the brick oven pizza there was the best I have ever had.. Recommend Fantasea for two couples looking to get away from hustle and bustle and just relax! We had 2 couples in our group staying for 8 days. The house was better than we expected. We had plenty of room, the furniture was comfortable, the temperature inside the house was cool, everything was in perfect working order and we had everything we needed in the house. It was also clean and there were no bugs. The view was amazing and the water lights up at night if you get in it and splash around as the house is right on the bio bay but beware of the sea lice (tiny jellyfish). They seemed to be mainly around the dock. We had Rosie come and cook for us at the house which was delicious (there is a magnet on the fridge with her number). The kitchen knives could have been sharper but we only used them on occasion. We enjoyed going to Rum Point, and to Kaibo. Both restaurants are great. They auto-grat everywhere so be aware. We also went over to Tukka\'s on the East side which was a great restaurant and there seemed to be more breeze on that side. We did the sting ray city tour from Rum Point, Starfish Point which is right down the road and the Crystal Caves but make sure you wear bug spray and take some water. It was very hot and humid in the caves. 2 couples rented this place for a week and had a great time. When we first walked in we felt that the pictures on the website did not do it justice. We have rented houses/condos at other locations and usually the pictures make a place look slightly better than it is, but this was not the case with Fantasea. The view at sunset is amazing and the bioluminescents in the bay were really cool to see. We rented paddle boards and would go out in the bay throughout our stay. We went to both the Kaibo Yacht Club and Rum Point Club which are very close. We only ventured into Georgetown/Seven Mile Beach on 2 of our days as there was plenty to do in and around Rum Point. 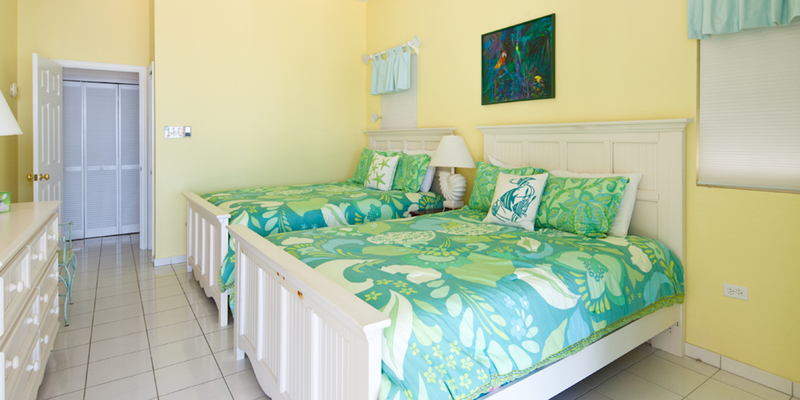 We had no issues or problems with the house during our stay and would recommend it to anyone going to Grand Cayman. We absolutely loved the home - Fantasea! We rent many homes all over as we travel on vacation with our family or just the 2 of us. Fantasea was without a doubt the cleanest and one of the best locations we\'ve experienced. And Judy and the cleaning women were great. Judy was great stopping by to introduce herself and was extremely responsive anytime we had questions or needed anything. In so many homes, staples like toilet paper, paper towels, dishwashing soap, laundry and cleaning products are not provided. It was wonderful having those items provided in Fantasea. And providing the water cooler was the absolute best. 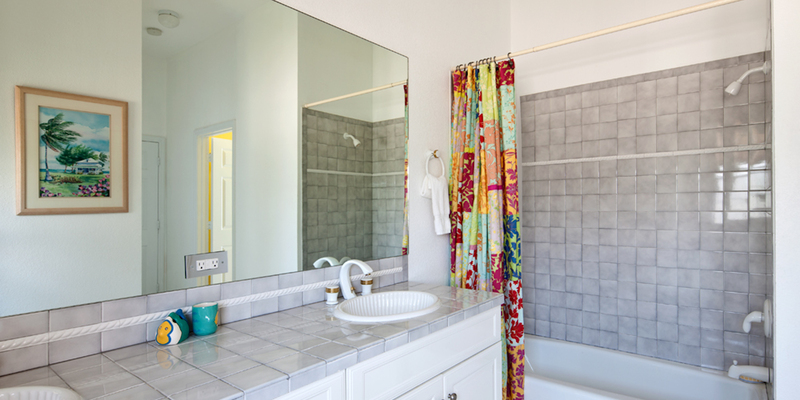 The bath and kitchen towels, pool towels and all linens were of great quality. Loved floating in the pool in the afternoon sipping on cocktails. The pool is small but served its purpose for the 2 of us. We loved making the majority of our meals at home there and then sitting at the table in the screened porch area to enjoy our meals and the beautiful views. The owners of this home really care and stay on top of maintaining this home down to spraying for bugs! Being close to Rum Point was another bonus. We loved going there to snorkel, watch the sunsets and enjoying drinks and a lunch or two at the beach restaurant - loved the jerk chicken meal with the beans & rice, corn on the cob and cole slaw. Kaibou was nice to walk to in the mornings to grab an espresso. And seeing starfish at Starfish Point early in the mornings was fun. Although the area is about 50 - 55 minutes from the airport, it is worth it. The area is so peaceful and away from all the hustle and bustle. Always felt safe especially seeing the local police patrolling. Nothing more peaceful and relaxing than looking out to see all the boats far off in the distance at Stringray Island and beyond that the city of Georgetown. We absolutely love Cayman and can\'t wait to go back again. Had a great time, love the place, we are saving up to return. We 100% loved everything about the place, location, clean, well decorated, nice sandy beach and just awesome! The pool was small but perfect Thanks for a great place to hide from he world!